Abydos, Egypt is an ancient city in the Upper Egypt region. Located barely six miles away from the Nile River, Abydos is a very important site in terms of archaeology. Abydos is home of the temple of Seti I which houses a list of pharaohs in cartouches, from Menes up to Seti's father, Ramesses I.
Óbidos, Portugal is an ancient city near the coast of the Atlantic Ocean. Called the Wedding Present Town, Óbidos is a romantic European medieval city. The Roman village and castle are among the remnants of Roman occupation during the first century. Located on a hill and surrounded by a fortified wall, Óbidos is a popular tourist attraction. Abydos can trace human occupation of the area to 3100 BC. Many towns, tombs, and cemeteries have been found in the area. The founder of the first dynasty, the pharaoh Narmer was buried in Abydos. The Great Temple of Osiris was built here as a funerary chapel. The ruins remain. 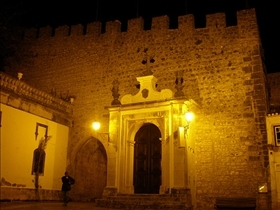 Óbidos was given as a wedding gift from King Dinis to Queen Isabel in 1282. Before it became a city of Portugal, the Romans and the Moors occupied Óbidos. The town hosts a Medieval Fair each year, which displays knights on horseback jousting, falconry displays and the normal medieval fare of jugglers, musicians, and jesters roaming the streets. Abydos boasts the Great Osiris Temple and the Temple of Seti. Known as the Great Temple of Abydos, the Temple of Seti is famous for its almost complete and very rare list of pharaoh names. Ramesses II Temple is located in Abydos as well, and while it is smaller than and not as ornate as the other temples, but shows historical scenes of his achievements around the outside of the temple. Óbidos has its own share of unique architecture. The castle of course was originally built by the Romans, but has been repaired and restored over the years. Remarkably, the medieval buildings and structures have been well-preserved. The fortified city walls remain, as well as the door to the city. Abydos is located in the floodplain area of the low desert in Egypt, six miles or so west of the Nile River. During ancient times Abydos was probably a river city, as the Nile has shifted gradually eastward over the years. A desert climate is typically of this area of Northern Africa where there is typically very dry with almost no rain. Annual summer floods of the Nile are all the local people have to meet their need for water. Óbidos is located on the top of a hill and surrounded by the fortified wall, near the coastal city of Lisbon in Portugal. Portugal shares a border with Spain along the north and east sides, and the North Atlantic Ocean on the south and west sides. Óbidos enjoys a Mediterranean climate with an average temperature of 60°F. Abydos and Óbidos are both ancient cities with rich histories. 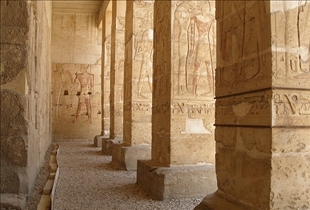 Abydos, Egypt is renowned for its wondrous collection of tombs and other archaeological sites. Abydos was home to many of the early Egyptian rulers and became a place of pilgrimage for Osiris worshipers. Óbidos, Portugal is a fortified city near the coast of Portugal where there are remarkable finds in the areas of archeology and architecture. The well-kept city still includes cobblestone streets, and colorful houses with flowerpot lined windowsills. All of this wrapped in the walls of a beautiful castle make Óbidos a romantic medieval village that many love to visit. Which ancient city would you rather visit?